Tune into ABC this Sunday April, 19th at 3:00pm for game one of the Lakers/Jazz first round NBA playoff series. The settling of the up and down western conference standings has finally come. The matchups are set, and the playoffs begin this Saturday April 18th. The first bout features the number one seeded Lakers going against the number eight seeded Utah Jazz. Time to discuss. The Utah Jazz have all season long been noted as a team who can be dangerous come playoff time, and especially for the Lakers since they were able to take their series last season to six games. But that was back earlier this year when the Jazz were in contention for a playoff seed as high as number two. Now the only recognition they are getting is that they can pose problems for the Lakers. Too bad they won’t pose enough problems four times. The Jazz are led by one of the league’s top point guards in Deron Williams with his 19.4ppg and 10.7apg. They are also spurred by the much improved play of Ronnie Brewer, Paul Millsap, and even C.J. Miles. If you throw in the scrappy play by international stars Mehmet Okur and Andrei Kirilenko, as well as the three point baller in Kyle Korver, you most certainly have a solid unit. However, the Jazz’s bad side is not too promising. Guys like Okur, Kirilenko, Brewer, etc do not have the ability to take over a game and can barely create their own shots. When you throw in the fact that the one other guy on the team who could have done that besides Williams, Carlos Boozer, has struggled to get back into the swing of things since his recent return from injury, then the Jazz are nothing more than a team that may be running on fumes by games four and five of the series. The Lakers on the other hand, now there’s a squad! No one on the Jazz (and much less the entire NBA) is the equivalent or on par with Kobe Bryant. No one on the Jazz is as consistent and solid as Pau Gasol, and the one guy who was close, Boozer, is still catching up. Another thing L.A. has going for them is that there big man who recently returned from injury, Andrew Bynum, has actually transitioned a lot smoother than Boozer. But the most telling characteristic about each team is this; the roles of the Utah Jazz players are mostly defined by what Deron Williams can do each night on the court whereas for the Lakers… everybody on the team knows their role. I believe that the high dependence for success resting on the shoulders of one player in Utah (Williams) against the unit on a mission to absolve last season’s failures in L.A. will undoubtedly prevail in five games. See ya Jazzies. 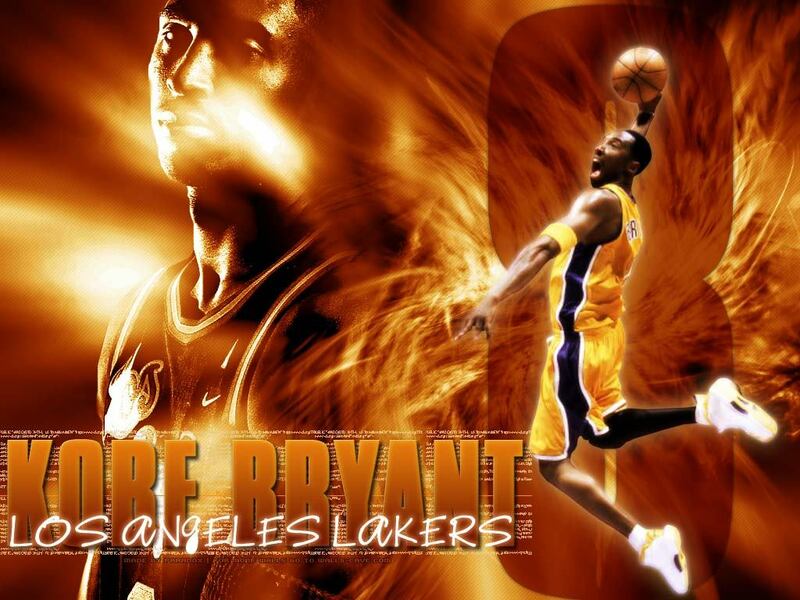 Kobe and his Lakers won't be denied as Western Conference champs. The Los Angeles Lakers seem to be miles ahead of their other western conference counterparts. They are currently 9.5 games ahead of the second place Denver Nuggets. That’s pretty good distance even for a season like this, wouldn’t you say? I would say, sir. On top of virtually securing home field advantage until they get to the finals (Cleveland currently owns the league’s best record), they’ve also got some favorable potential opponents. The eighth seeded Dallas Mavericks are clearly not at the top of anyone’s playoff brackets. Number six New Orleans has not found as much success as last year, and has been injury riddled, and has also suffered from the loss of Janeiro Pargo from last year. Number five, Portland, is pretty spunky, but they’re still young. The number four Houston Rockets look promising, but they suffer from a lack of scoring, although they are great at defense. I’d say the ‘scariest’ teams for the Lakers are the number seven Jazz, who took them to six games in last year’s second round of the western conference playoffs. They are one year older and their other players are almost doubling their career ppg from last season. Then of course, at number three, are the experienced San Antonio Spurs. They know the Lakers well and have always been master executers in crunch time. Finally, the number two Denver Nuggets. They’re gaining a lot of confidence behind their calm new leader, Chauncey Billups, and players are getting their work done in a much more efficient basketball manner. But the Lakers have Kobe Bryant surrounded by immense talent, and will not fail to make it to at least the NBA Finals this season. 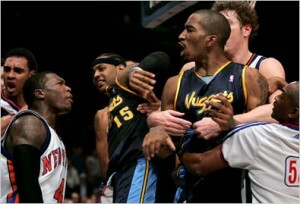 Come one, come all and see some of the few fights we have from classic NBA matchups. To be honest this video is not just all fights but also includes hard fouls as well. Watch and enjoy as Vince Carter makes a fool of himself at the Olympics while representing America. He must have lost his attitude when he lost his hair, hahaha. Be sure not to miss Ron Artest involving himself in drama on this tape as well. Enjoy! oh yeah Reggie and Kobe go at it! Sweet! LeBron James' career year has him posting 28.1ppg, 7.4rpg, and 7.0apg. Those are the numbers of a star. Much has been said this year about the great record and stellar play of the Cleveland Cavaliers as a unit. They currently are 2nd in the league in points given up per game only behind the Boston Celtics. Not only do they defend well, but with a league-best 28-1 home record, if they can hold onto their current number one spot in the east, then they would look to be a good favorite to enter the NBA finals. Guess again. Although the Cavs literally wipe the floor with their non-playoff contenders when they play them, they tend to struggle against the top-tier teams of the league. They can’t beat Boston, and always seem to get thumped in the fourth quarter by them, and if they intend to win a championship, they’ll need to find a way to beat L.A. who swept them in convincing fashion with one of those losses resulting in their lone home loss. On top of that, they even lost by more than 10 points to Orlando in Orlando this year. Their only convincing wins against a contender has been against the San Antonio Spurs, who they beat in Texas a few weeks ago after LeBron had his worst game statistically against the Houston Rockets. In my opinion, if they face Boston or Orlando, they go down. If they somehow get to the finals and they face off against the Lakers, who not only have lots of different scorers, but are playing much better defense this year, they won’t win the title. All three teams have more than one all-star caliber player; the Lakers have Kobe, and Gasol, the Celtics have Garnett, Pierce, Allen, and Marbury, and the Magic boast Dwight Howard, Rashard Lewis, and Jameer Nelson. And even though James is a league leader in MVP voting, it takes more than one man to win in a league where All-Stars are almost always a necessity. Kobe has already started 2009 with a bang. This week Kobe played the way legends do. Kobe put in 61 points against the New York Knicks in their home arena, breaking Bernard King’s long time record of 60 points. The funny thing is when you think about it this point total is 20 points less then his personal best…my lord, Kobe is the #1 player in the NBA…Nuff said! I made this highlight video only using footage from one of my online games. I decided I was going to Kobe ball him to death, and I shattered the record of 81 points in a game for Kobe Bryant…The big reason I made this vid, was to let everyone know how bad this kid is. I can’t stand how many quit in NBA live 09 online and I am starting to make videos to hopefully mock and deter people from quitting…Too bad this kid was a chump and quit because I was definitely going to score over 100 points…Enjoy the show..
Kobe showing off the new "Hyperdunks"
I was just surfing the Net and I found a video that I thought was really interesting, from a production standpoint. This video was pitching the Kobe Bryant’s new shoe from Nike, which are the “Hyperdunks”. 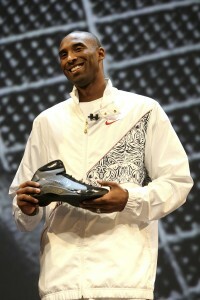 I haven’t been a big shoe guy since Jordan exited the league, but I’ll tell you what those shoes are hot. If I get back into playing ball on the weekends, expect to see me at the cash register picking those boys up. I really liked the commerical. Let me know what you guys think? I just thought it was a great idea for a video and I wanted to know if anyone else thinks so! Dwyane Wade, aka Flash, may very well be holding the MVP trophy at the end of the season. Who is the Man whose momma spells the name “Dwayne” as “Dwyane?” Who is the Man who leads his team to victory by being the league’s top scorer at 28.7 points per game, almost a full point over the one they call “King” with 27.8 in Cleveland? Who is the former Marquette Master that let his team sit back and watch as he carried them to four straight victories once upon an NBA Finals ago? Who is this Man you say? D-Wade? Yea… that and Dwyane Wade. For those of you who it isn’t too early to be talking MVP yet, Dwyane Wade ought to be your man. He has no Shaq, and at 9-9, has his team just four wins shy of the 13 total they had all of last season. To say he has gotten much help would be a bit of a stretch. Sure, Michael Beasley has been turning in a pretty fine rookie season at 14.7 points per game with a 45% field goal percentage. Other than, they have no big men and their pick up from last season, Shawn Marion has not presented himself as much of a scoring threat with just 12.3 points per game (coupled by a big 9.3 rebounds per contest), but at 6ft 7in, he is shorter than rookie Michael Beasley at 6ft 9in! Thus far, Dwyane Wade has played like a man who wants no part of the shame and deplorable play his city and fans suffered through last season, and definitely does not want to be watching most of the playoffs as opposed to playing in at least part of them. As long as Dwyane Wade can keep carrying his team to victory, especially in the fourth quarter, he has my vote for MVP right now… D-Wade! All the other usual and potential names, Kobe Bryant, LeBron James, Paul Pierce, Kevin Garnett, Steve Nash, Tim Duncan, Brandon Roy, Chris Paul, or Chauncey Billups have an at least decent supporting cast around them. don’t agree leave a comment.